Easy Seafood Recipes – Seafood Recipe – Recipes For Seafood | Cook Eat Delicious! Seafood encompasses any form of food taken from the sea. Yum! Oysters, crab, shrimp, mussels, lobster, clams, and fish, all seafood. I love seafood, my favorite food. Don’t get that frozen stuff, stick to fresh seafood that smells fresh like the ocean, not like fish. It is old when it gets that fishy smell. I love raw oysters on a half shell, dungeness crab roasted in butter and garlic, steamed mussels, and a great thick clam chowder. Need an idea for a seafood recipe? Try one of our easy recipes for ideas to wow everyone you serve with delicious food. I am all for easy recipes. And if I can make a delicious pasta dinner in under 15 minutes, then I am sold! This crab recipe does just that. In the time it takes to boil the pasta, you are done cooking the sauce. 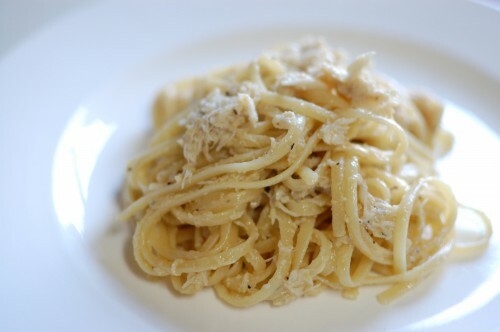 I use lump crab in this recipe and it is just a matter of heating the crab meat in the sauce and tossing in the pasta. Delicious Rating: Butter…Garlic…Crab…Pasta…really?! Are you seriously wondering if you should cook up this recipe?! GO! Buy the ingredients and make this up for dinner tonight!!! Sitting on the beach, relaxing to the sound of the waves crashing on shore, and eating, eating very well. That was our delightful experience in Tamarindo, Costa Rica. We ate at a beach front restaurant called Lola’s. It offers fresh seafood and simple dishes full of flavor. Fresh fish on the beach is always a great experience and this was no exception. 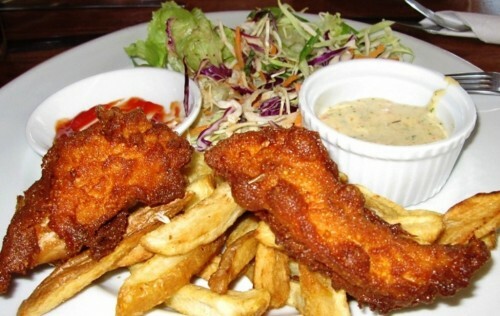 The fish is Tilapia and was moist and flavorful with a delicious crispy batter that it was fried in. It came with a side of coleslaw and fries or ‘chips’. The fish is definitely the star of the show. Full of Costa Rican flavors, the batter stays crispy not getting soggy at all. Check out the easy recipe for this Costa Rican fish after the jump! Who doesn’t love a warm bowl of thick chunky clam chowder? Growing up in coastal towns really made me fall in love with clam chowder. The thick tender potatoes in a creamy clam soup base….yum! My DH loves clam chowder so I always try to cook up a nice pot on a windy day since we don’t get many cold days here in Costa Rica! Delicious Rating: This easy recipe gets all the stars in my book. It is thick and chunky. The clams are abundant and the chowder base is creamy and not thin at all. I add bacon to just have bacon! And since when was bacon and seafood and potatoes a bad combination? This is by far my favorite and the best clam chowder recipe I have ever cooked up. Let me know what you think of it! One of my many diets included in my yo-yo dieting (another story, another blog) was a baked salmon diet. Everyday I would eat baked salmon. By itself, on bread, with rice, in salad, atop pasta. I never once got tired of it. I would literally just bake a salmon fillet and that would be that. Rarely would I add any spices or sauce to the salmon, I love the taste of salmon on its own. However, my DH hated it. 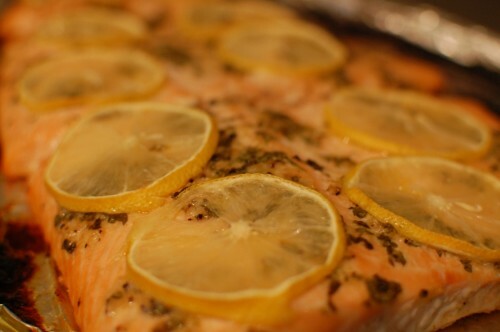 Baked salmon is so boring to him, even if it is marinated or covered in the best possible herbs and sauces. Well, it has been awhile since my baked salmon diet but I decided to give it another try and use some lemons since they were in town. Delicious Rating: Delicious! Baked salmon is an easy dinner recipe that can go with grains, veggies, or whatever you please. The basil in this recipe combines so well with the lemon and parsley, total yum factor. What did my DH think you ask? Well, he said it was good…and then said, “I just don’t like baked salmon.” Okay, I guess it isn’t for everybody. What about you?